Casa Pietra is surrounded by picturesque countryside, yet only 5 minutes from the historic town of Atessa. The beautiful local sandy beach, lakes and leasure pools are all within 20 minutes drive. The Casetta is a separate one up, one down building. You can choose to stay on your own patio and still have total privacy from the main farm house. You have shared access to all the shared areas of the grounds, including the pool and play areas. 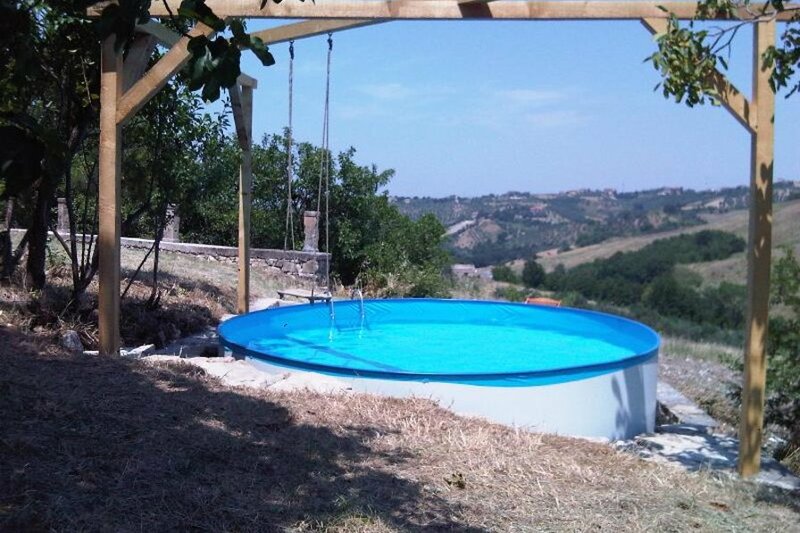 Holiday in the beautiful Italian region of Abruzzo the "garden of Italy" and land o f 1000 Castles, staying in an 18th century stone farm house. If you are looking for a brilliant holiday to light up your year, you have come to the right place. The Abruzzo region is a remote region often overlooked by tourists. It has spectacular natural scenery, medieval castles and villages, monasteries, and Roman ruins. Two-thirds of the Abruzzo's land is mountainous with the rest being hills and coast. A third of the region is designated as national or regional parkland. Bordering regions are the Marche to the north, Lazio to the west, Molise to the south, and the Adriatic Sea to the east. Beaches. Abruzzo’s 129 km long sandy coastline (interrupted in places by pebble beaches) is home to many popular beach resorts. Beaches worth visiting are in Fossacesia and Vasto Marina, on Abruzzo’s southern coast, many of the seaside resorts are considered among the best in Italy. Beaches of Abruzzo are pristine and the waters of the Adriatic are warm. Lifeguards are operative full-time on most italian beaches, during the summer season. It is best to follow posted warning signs and status flags describing the sea's condition on the day you decide to take a swim. Most beaches have corded off bathing areas - pass these at your own risk, as the waters deepen significantly very quickly. Skiing. Abruzzo has 15 ski resorts with 368 km of runs in 172 different ski tracks, all within a couple of hours drive from Rome. The most popular resorts are Roccaraso, Campo Felice, Campo Imperatore. Located on the highest altitudes of the Apennines, these ski areas are at heights nearly comparable to many resorts in the Alps. Because of their proximity to the Adriatic and winter precipitation patterns, they often have more snow than the Alps. Abruzzo also is popular for cross country skiing, especially on the high plain of Campo Imperatore in the Gran Sasso as well as the Piana Grande in the Majella. Hiking, horseback riding, mountain climbing and sightseeing. Abruzzo's extensive park system lies within two hours of Rome or less and includes natural beauty akin to national parks in the western United States. Within Abruzzo's parks lie some of Italy's most beautiful ancient hill towns rivalling those of Tuscany and Umbria. ZOO. Near the little village of Civitella Casanova is a nice zoo: Parco Zoo La Rupe. It's built on a mountain with a beautiful view and it features many animal species. Rock Climbing Abruzzo offers a great destination for rock climbing, beach combing, and mountain biking. Amazing rock climbing areas are: Petrellia Liri, Roccamorice, San Vito, Assergi, Monticchio, Capestrano, Fara Sam Martino.